Every so often an ad campaign comes along that really piques my interest. Now, I'll admit, there's a lot of good advertising out there, just as there's a lot of bad advertising out there. But the advertising that I believe works well is the kind that jumps out at you from a mile away and grabs your attention for longer than 3 seconds. It is then that I believe the ad agency is doing a great job. Now, let's talk about this new "Unhate" campaign by United Colors of Benetton. Don't get me wrong, I could care less about the brand. But, Benetton was once known in the late 80s and early 90s as being this daring, controversial brand that utilized the social issues about race to their advantage to sell clothes. As an ad guy myself, I have to admit, that was pretty smart. Well, fast forward to 2011, and United Colors of Benetton has done it again. 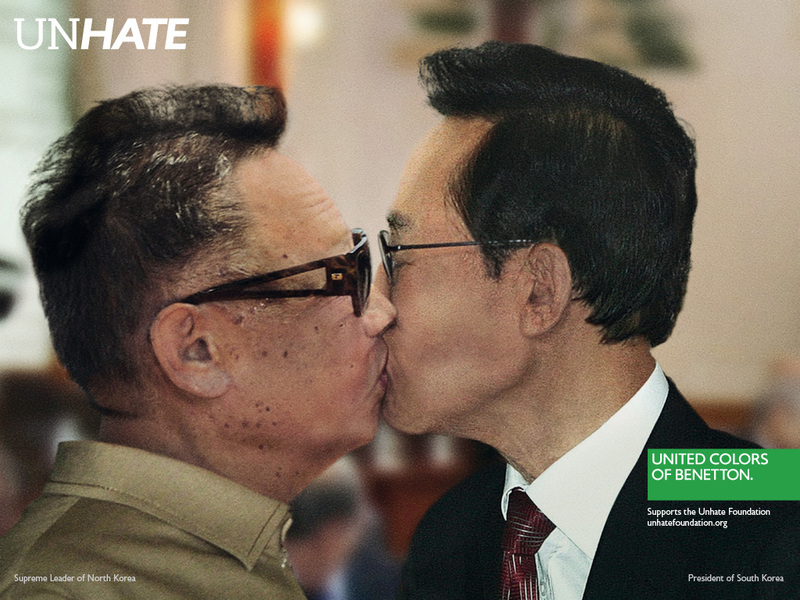 Check out their latest ads featuring famous icons "unhating" each other with a gentle kiss. Not bad, Benetton, not bad at all. Okay, so what does this have to do with movies, which is what I usually like to blog about? Well, I'm getting to that, so hold your damn horses. After I took the time to check out the full campaign here, I discovered a pretty sweet short film by French director Laurent Chanez that depicts the unbalance and complexities between the drive to hate and the reasons to love. Go ahead, check it out for yourself. It's pretty impressive if you ask me. See what I mean? It's amazing how much a well made film can influence ones opinions on society. How we all have the power to make the world a better place if we just stopped hating each other for whatever reason, and started treating each other like decent human beings regardless of race, gender and sexual orientation. How we should all unite together and stop the violence in hopes for a better place for our children to live. Or maybe that short film just means that I need a new suit. Yeah, come to think of it, I do need a new suit. But not from Benetton, that shits expensive.